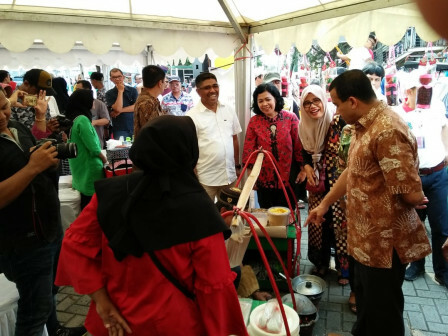 East Jakarta Mayor, Muhammad Anwar, officially opened a cultural arts performance in the superior area of Jakarta Gems Center, Rawabunga, Jatinegara, Sunday (9/2).
" We've coordinated with PD Pasar Jaya, to collaborate in reviving the Jakarta Gems Center"
The visitors can watch various cultural arts performances and can taste typical Betawi cuisine. It is held to enliven the Jakarta Gems Center that later began to decline in visitors. It is expected that visitors would come and shop more at the shopping center. "We've coordinated with PD Pasar Jaya, to collaborate in reviving the Jakarta Gems Center. Hopefully, this market will be crowded again," he stated. East Jakarta Tourisma nd Culture Sub-dept. Head, Iwan Henry Wardana added that this festival is to boost the economy. And it is expected that Jakarta Gems Center will again be crowded by the public. "Lately, agate sales have begun to fade. That's why we jack it again through this festival. For the sale of gemstones still survive," he stressed. There will be Betawi arts performance in the festival, starting from gambang kroming, welcome dance, bodoran and ondel-ondel. Not only that, 15 culinary and handicraft booths will also color the festival.